The application VeryPDF Advanced PDF Tools Command Line allows you to compress image in PDF document to make PDF for a smaller size or for fast web viewing. This application supports to compress monochrome image, grayscale image and color image. 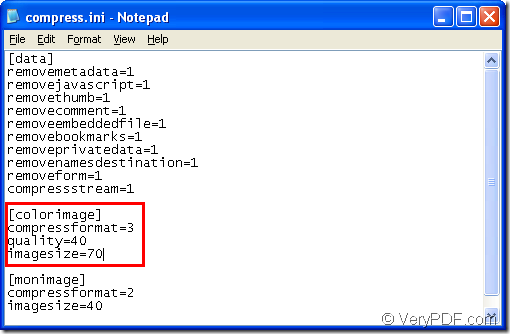 In this article, you will see how to use this command line application to realize the function that you need. Please free download VeryPDF Advanced PDF Tools Command Line at first and then extract this ZIP file to your computer. 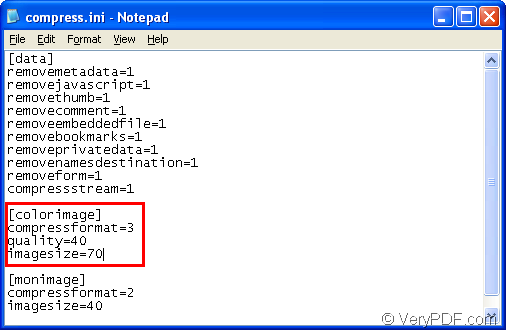 You can browse the .txt document readme.txt in unzipped file package to see the usage and options of the application. The executable file pdfcompress.exe is the called program of the application. With the same way, you can also compress grayscale image or monochrome image. Please see compress.ini file in following snapshot. The image in your PDF document will be successfully compressed and you can view the created PDF document in the specified location. If you want to have a try of this application, please click the following button to download the free trial version of VeryPDF Advanced PDF Tools Command Line. In order to get more information about the application, please visit the homepage of VeryPDF Advanced PDF Tools Command Line. This entry was posted in Advanced PDF Tools and tagged command line, compress image. Bookmark the permalink.